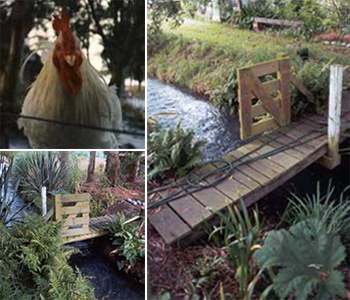 Rooster Bridge is named after our first rooster. He was the subject of a university bonding and imprinting experiment, and came to live with us just when he was fully feathered. Rooster started off being a good gardening companion. He would poke around and peer into planting holes, and I'd have to hide any worms I uncovered. One windy day he helped me paint the fence with brown stain. He got rather speckled. Oops. Being hand-reared, rooster started off totally tame. But when puberty struck he developed some rather bad habits. He grew spurs, and became totally pecky. Unattached shoes or plastic cat bowls would be subjected to embarrassing displays of passion. White gumboots were considered to be a rival rooster (he himself was a large white) and if the wearer tried to kick him away he would attack with full rooster force. He was hilarious, but at the same time quite dangerous, and had to be contained on the other side of the water race. Rooster Bridge was originally narrower, covered with slippery broken planks, giving somewhat wobbly access over the water to the Hen House. Non-Gardening Partner did some major repairs, and then designed a gate midway across. Wheelbarrows and gardeners could still fit through, but roosters couldn't. 'Le Grand Poulet' (oops) couldn't quite gain enough altitude to fly across the watery stream. Thus he was banished to the other side of the water race, where he couldn't get into trouble. 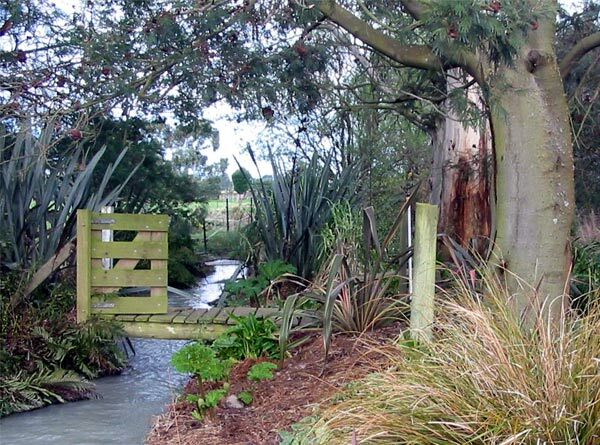 Rooster Bridge links the top of the Wattle Woods to the Hen House Gardens, with a paths leading to and from it. Nearby are species Phormiums, ferns, and my own 'exotic' plantings (like Gunnera, Arum lilies, and Schizostylis). 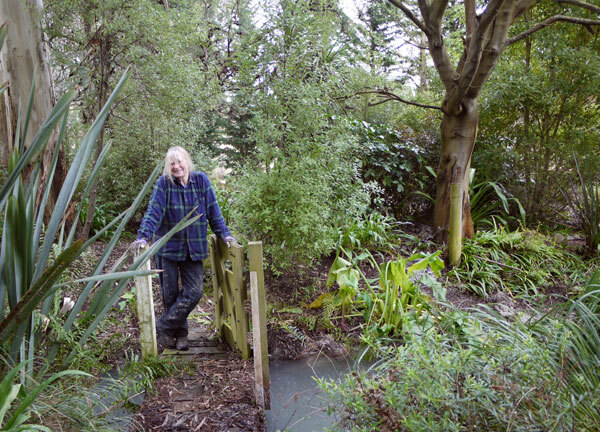 The garden by the bridge has been further developed since these photos were taken. It's a delightful area to work in, shady and secluded, with the water burbling through the greenery. And lovers of low-tech can pause mid-bridge and watch two bright orange river pumps slowly revolving. They feed the wriggling little stream in the Wattle Woods below.